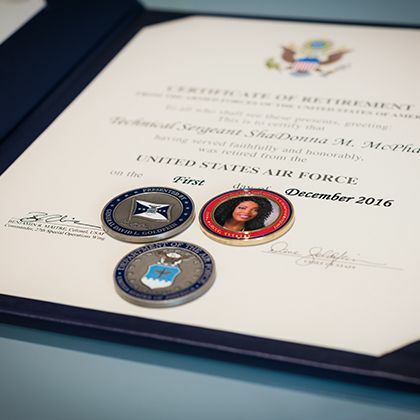 When ShaDonna “Mo” McPhaul joined the Air Force in 1996 at age 18, she had plenty of support. Military service is a family tradition. Every summer, she visited her aunt and uncle, who both retired from the Army. They were her main influences for joining, but a grandfather, a stepfather and lots of cousins also served. She’s using social media and her own weekly radio show to help spread the word. “Information dissemination,” as it’s called in the military, is one of the primary skills she took from her service. During her 20-year military career, McPhaul got to see the world. She was stationed in her hometown of Fayetteville, N.C., at Pope Air Force Base but also served at Eglin Air Force Base (Florida), Joint Base Pearl Harbor (Hawaii), Cannon Air Force Base (New Mexico) and bases in Korea and Germany.